MARKHAM, Ontario, Nov. 22, 2018 /PRNewswire/ — In just over two decades, Lorex Technology has established itself as a powerhouse in the video surveillance industry by (through innovative ideas) developing top-notch security camera systems for the home and small business markets. Always striving to provide our loyal customers with the most cutting-edge and user-friendly security solutions, Lorex is pleased to announce their annual Black Friday Sale will feature 25% off all products site-wide. 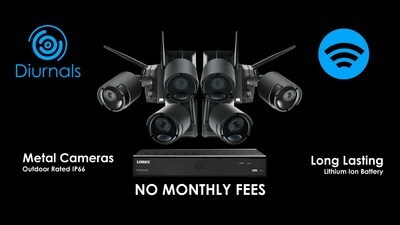 Whether you’re in the market for a system upgrade or stepping into the world of video technology for the first time, Lorex has a wide range of products to choose from – including our most recent innovations, the 4K Nocturnal and Wire-Free Diurnal security systems. Grainy footage, choppy video and mediocre quality night vision are now a thing of the past. With heightened 4K resolution, long-range color night vision, 24/7 surveillance and much more, this latest incarnation of the 4K Nocturnal camera, with its bold design, takes personalized home security into the 21st century. 4K Ultra HD resolution: What good is a security camera if the footage isn’t crisp and clear? With over 8 million pixels, this 4K Nocturnal camera produces the finest quality footage, so no second guessing is necessary. Due to the high pixel count and the powerful image sensor at the core of this camera, the smallest objects on screen are clearly outlined and easily identifiable, even in low-light conditions or when the digital zoom is applied. Long-range color night vision: With the help of ambient lighting, this camera has the longest color night vision (CNV) range available at 175 feet. CNV offers an extra level of security, providing vital details such as the color of cars, clothing, hair and other surrounding objects that the human eye cannot easily decipher. 24/7 surveillance: As a wired security camera, the constant power supply means this 4K Nocturnal is continuously recording, regardless if there is movement in the camera’s field of view. It is especially useful for highly congested areas, as continuous movement often depletes battery-powered systems at a faster rate. Realistic-looking video at 30fps: Say goodbye to choppy or unnatural looking footage. Because of the higher number of images that appear in each frame, 30 frames-per-second (fps) delivers the most lifelike and flawless on-screen movement so important moments are never misinterpreted. Defy the elements: Rated IP67, these Nocturnal security cameras have been tested in extreme weather temperatures ranging from -22°F (-30°C) to 140°F (60°C), and they can safely operate during a wide range of conditions including heavy rain, snow and strong winds. Protected by heavy duty aerospace-grade aluminum, these cameras can withstand years of weather corrosion and vandal attacks. For a fast and simple D-I-Y video surveillance system, the latest Wire-Free Diurnal is the perfect solution for high-tech security, minus the lengthy wires. Battery-operated, with infrared night vision, 1080p HD resolution and more, it is a motion-based system that is ideal for low-traffic areas. Hybrid security: The Diurnal camera is a motion-based, battery-powered security camera, meaning it is on standby and only starts recording when movement is detected. They can be placed up to 600 feet away from the wireless receiver, or they can be easily connected to a power source for round-the-clock surveillance if needed. 1080p HD resolution: Thanks to the megapixel sensor in the core of the Dirunal wire-free camera, expect to see flawless 1080p HD resolution footage with clear color depth. Crucial details such as facial characteristics and license plate numbers will be clearly noticeable. Infrared (IR) night vision: The 6, high-powered LED bulbs that surround the camera lens emit invisible, infrared (IR) light up to 150 feet away. This allows the Diurnal camera to capture footage in dimly lit environments and total darkness for crisp and clear nighttime vision. All-weather performance: Diurnal cameras have an IP66 weatherproof rating and will continue to function in extreme weather conditions between -4°F to 113°F (-20°C to 45°C), so they can be safely installed outdoors. The sleek, but sturdy casing protects against dust and water, and long-term wear and tear caused my rain, snow or wind. Two-way audio: Diurnal wire-free cameras come equipped with a microphone that will record audio along with video footage for extra protection and evidence. It is also possible to speak through the microphone using the Lorex Cirrus app for tablets or smartphones. Established in 1993 in Markham, Ontario, Lorex Technology is the authority in the home and small business video camera solutions. For over 25 years, Lorex Technology has provided top-of-the-line video technology products to its customers in North America and around the world. Today, Lorex Technology prides itself as a leader in do-it-yourself (DIY) and professional-grade home and business security solutions and continues to develop sophisticated and cutting-edge technologies aimed at helping customers protect their loved ones and property.